The International Affairs Committee promotes the mission of the SRM by providing information to SRM members on rangeland science and management in an international context and by informing the international community about SRM’s role and the opportunities SRM provides for professional development and participation in rangeland issues. For information on the International Travel Fellowship Award, click on the “International Travel Fellowship” tab on the left menu. We are very grateful to the following who have contributed in the past via the voluntary check-off on membership forms. The check-off is specifically designated for developing-country memberships. This travel fellowship is awarded to rangeland scientists from developing countries to allow them to attend annual SRM meetings. One $2,000 fellowship is available. Support attendance at the Annual Meeting by rangeland scientists or managers from countries other than the U.S. and Canada. Foster international exchange about advances in rangeland ecology and management. Name, institution, email address, postal address, citizenship. A summary of your research (500 words maximum) explaining how your research extends the scientific basis or application of rangeland ecology and management (see Selection Criteria listed below). Title and abstract of the paper or poster you submitted for presentation at the upcoming Annual Meeting, if any. An explanation (also 200 words maximum) of why you need financial assistance to attend the Annual Meeting (see Selection Criteria listed below). A statement that the applicant understands the need to determine their own visa needs for travel to the Annual Meeting in February 2019. The IAC understands that while confirmation of the award might be necessary before the visa application process may begin, it is also important that earning a visa will be possible between the time this travel award is granted and travel to the meeting. Thus, awardees are required to respond to a travel award offer within 10 business days to confirm the likelihood of obtaining necessary travel documents and permissions. The research summary and CV will be evaluated for scientific merit with regard to your past record of research accomplishments, promise of future accomplishments, and applicability to rangeland ecology or social science and management. We will favor applicants who demonstrate that their research advances (i) the scientific basis of rangeland ecology or social science, and/or (ii) the application of rangeland ecology or social science for rangeland resource conservation and management. New and established rangeland professionals are encouraged to apply. Financial need. You must demonstrate financial need and show that without ITF support, you would not be able to attend the Annual Meeting. Applicants must demonstrate the extent to which they have pursued travel funding from their host institution. Clarity of expression and proficiency in the use of English. Evidence of feasibility to enter the US in time for the 2019 Annual Meeting. Dr. Javier Naupari was the recipient of the 2017 SRM International Travel Fellowship award. He received the $1,600 award and a waiver of his registration for the meeting. During the meeting, Dr. Naupari met with the International Affairs committee and provided the committee with a presentation and video about National Agricultural University, La Molina, in Lima Peru where he currently works as an Associate Professor in the Animal Production Department. During a technical session later in the week, he gave an oral presentation titled: Llamas and Cattle Grazing Effects on Rangeland Hydrological Function. Dr. Ñaupari received his B.S. degree in Animal Husbandry and M.S. degree in Animal Production from National Agricultural University, La Molina, in Lima Peru. He received a Fulbright Scholarship that allowed him to pursue his Ph.D. in Natural Resources from University of Idaho. He was also a Fulbright Nexus Scholar in 2012-2013. His research focuses on remote sensing and geographic information systems applied to ecological processes in mountain rangeland ecosystems. He serves as the principal researcher of the Rangeland Ecology and Utilization Laboratory at La Molina, and is currently involved in research projects assessing the ecological status and productivity of rangeland ecosystems and the impacts of climate change on livestock production. He also directs the Office of Technical Cooperation at La Molina. 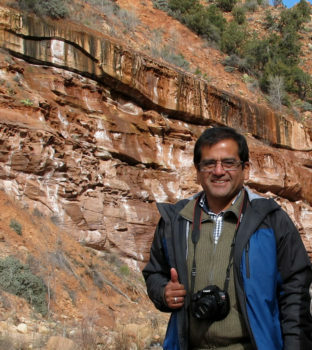 Javier A. Ñaupari of Universidad Nacional Agraria La Molina, Peru enjoying the “Red Rocks and Rangeland” during the Zion National Park tour. Mr. Martín Do Carmo of Uruguay received the $1,000 International Travel Fellowship plus a waiver of the non-member registration fee to attend the 2015 SRM conference in Sacramento. He was present at the annual meeting of the SRM International Affairs Committee and presented a poster later in the week entitled, “Measurement of Campos Rangelands Herbage Mass by Simple Methods.” His co-authors on the poster were G. Cardozo and P. Soca. Mr. Do Carmo received his B.A. and M.S. degrees in Agronomy from the School of Agronomy at the Universidad de la Republica in Uruguay. Following attainment of his master’s degree in 2013, he has been employed as a researcher with the Instituto Nacional de Investigación Agropecuaria, also in Uruguay. His professional experiences vary from work in tropical pasture assessments in support of dairy and beef production to analyses of the bio-economic efficiency of beef cow-calf systems. Mr. Do Carmo already has over 25 publications and has been the recipient of several funding awards and training scholarships. Mr. Do Carmo wanted to attend an SRM meeting because he desired to learn more from American researchers. He also wanted to make professional contacts to spur future research and educational collaborations. We were delighted to meet Mr. Do Carmo. His friendly demeanor and enthusiastic smile are memorable. As a bonus when attending the SRM meeting Mr. Do Carmo joined several of the SRM-sponsored tours; on the San Francisco tour he was able to ride a bicycle across the Golden Gate Bridge. Truly great recollections for a fist-time visitor to the USA! Mr. Martín Do Carmo of the Instituto Nacional de Investigación Agropecuaria, Uruguay, with 2014 SRM President Jenny Pluhar. Professor Kevin Kirkman received the $1,000 International Travel Fellowship at the 2014 SRM conference in Orlando. He presented a paper entitled, “Grassland management strategies for subsistence livestock production in South Africa.” His work was part of a symposium called, “Unsettled Futures for Subsistence Pastoralism” sponsored by the Feed the Future Innovation Lab—Adapting Livestock Systems to Climate Change. Click here to view more information about the symposium. Professor Kirkman is a graduate of the University of Natal (South Africa) with a PhD in Grassland Science. He subsequently worked as a researcher for the Mpumalanga Department of Agriculture for nine years, where he conducted research in veld management. He then worked for two years as a pasture advisor in the dairy industry. In 2001 Kirkman joined the University of Natal (now called the University of KwaZulu-Natal) as a Professor of Grassland Science, and has continued his research in veld ecology, management, and restoration. He has also served the same institution as Head of the School of Biological and Conservation Sciences as well as Deputy Dean of the Faculty of Science and Agriculture. Kirkman is currently the Director of Professional Services for the College of Agriculture, Engineering, and Science. Dr. Kevin Kirkman-University of KwaZulu-Natal, South Africa, with 2013 SRM President Wally Butler. – Photo courtesy of Katrina O’Farrell. Veronica Vasquez Garcia received the $1000 International Travel Fellowship at the 2013 SRM conference in Oklahoma City. Veronica is a full professor at the Colegio do Postgraduados in Mexico. She studies gender and environmental issues in the Mexican countryside. She does extensive fieldwork and has advised 19 graduate students from Mexico, El Salvador, and Spain in their research projects. Veronica received her doctorate at Carleton University in Canada. Her presentation at the conference was “Livestock Farming in Mexico from a Gender Perspective”, which she presented as part of the International Affairs Committee’s symposium, “Women as Change Agents in the World’s Rangelands.” Her presentation and abstract are found under the Activities tab for this committee. This symposium included an excellent group of speakers who reviewed changing roles for women in the world’s rangelands. Rangeland populations have historically been marginalized in terms of their access to public services and lack of exposure to the outside world. Social, economic, and technological forces are rapidly altering this situation, however. Women are now having larger profiles as community leaders, range managers, and professionals in research, extension, or agency administration. This symposium explored such trends and asked what these gender dynamics imply for new frontiers in rangeland research, outreach, education, and rural development strategies, both overseas and in North America. We thank the donors who supported this symposium. They included: the SRM Board of Directors, the SRM International Affairs committee, the SRM Oklahoma Organizing Committee; SRM Sections of the Pacific Northwest, Arizona, and Nevada; the National Riparian service Team, the Brainerd Foundation, the Sustainable Northwest Foundation, and the Commonwealth Government of Australia. From Left to Right – Sally Leigo, Robin Boies, Barbara Allen-Diaz, Corinne Valdivia, Layne Coppock, Pat Johnson, Tungalag Ulambayar, Caryl Elzinga, Jeannie Harvey, Rachel Mealor (front), Becky Hatfield-Hyde (rear), Laura Van Riper, Veronica Vazquez-Garcia, Hailey Wilmer, Claudia Radel, Maria Fernandez-Gimenez, Amy Ganguli, Katherine Minthorn-Goodluck. 2010 – Pastoralists and Property Rights. In 2010, there were two symposia. The first was Community Based Conservation on the Rangelands. This symposium brings together scholars and practitioners from various regions of the world to share and discuss their experiences with community-based rangeland conservation and management, with the aim of identifying common threads, potential best practices, and needs and opportunities for broader collaborative research to document the process and outcomes of these efforts. This symposium was largely funded by Dow Agrosciences. The second was Pastoralists and Property Rights. This symposium examines this paradox of pastoral land tenure (the simultaneous demands for tenure security and flexible access to spatially heterogeneous resources), bringing together pastoralists and scholars from multiple continents to reflect on their experiences with pastoral tenure transformations, and their implications for the well-being of livestock keepers and the lands they depend upon. This symposium was funded largely by a grant from Dow Agrosiences. 2009 – Borderlands Watershed Management: a Collaborative Approach to Resource Management. Scientists from the United States and Mexico presented a bilateral perspective on the issues and challenges in watershed management along the US-Mexico border (funded largely by a grant from Dow Agro-Sciences). Resulting publication: A special feature containing seven papers. 2009. Rangeland Ecology and Management 62(4). Bedunah, D.J., McArthur, E.D., Fernandez-Gimenez, M. 2006. Rangelands of Central Asia: Proceedings Conference on Transformations, Issues & Future Challenges. 27 Jan 2004, Salt Lake City, UT. Tropical Grassland Society of Australia, Inc.
Lusigi W. J. and John Buursink. 1994. Sahel Operational Review : Status and Lessons Learned. AFTES Paper # 11. Environmental Policy and Planning Series. Technical Department, Africa Region, The World Bank, Washington D.C. For copies of this study, please contact Ms. Leita Jones, Room J3-263, The World Bank, 1818 H Street NW, Washington, D.C. 20433. Tel.no. (202) 473-5030. Miller, Daniel J. and Sienna R. Craig. 1997. Rangelands and Pastoral Development in the Hindu Kush-Himalayas. International Centre for Integrated Mountain Development, Kathmandu, Nepal. Cid, M.S., R. C. Fernández Grecco, M. Oesterheld, J. M. Paruelo, A. F. Cibils, and M.A. Brizuela. 2011. Grass-fed beef production systems of Argentina’s flooding pampas: Understanding ecosystem heterogeneity helps improve livestock production. Outlook on Agriculture 40: 181-189. Anderson, D.L., G. L. Bonvissuto, M. A. Brizuela, G. Chiossone, A. F. Cibils, M. S. Cid, I. Feldman, R. C. Fernández Grecco, C. Kunst, M. Oesterheld, G. E. Oliva, J.M. Paruelo, R. H.Peinetti, and E. S. Villagra. 2011. Perspectives on Rangeland Management Research and Education in Argentina. Rangelands 33: 2-12 .